HA! I couldn't help but to use that title. I can't believe I have allowed so much time to pass since I last posted. What can I say? Life has a way of keeping you busy! What is up at Sweet Spot? Well, I was on a crazy paper blossom frenzy and then I dunno what happened, it just kind of dried up. We were finally getting better weather (and that makes me cabin-crazy) and today we actually have snow. It's like somebody is playing a really mean joke on me. I haven't even been online as much as normal but I have tons of custom projects lined up and I need to get a move on them! From a masculine parisian shadow box to a bedroom for a princess and a Bollywood bash. I also want to redecorate my home and finish reorganizing my studio. Time, where are you? I have to say, seeing all the different things typed out gets me a bit stoked that I can do such varied things as work. I did want to share some pictures of a quilled card I made with my new quilling tool. I literally said "Oh my goodness" to myself as I was using it. It is incredible how it makes the dreadful centers disappear. It's so thin and comfortable in the hand. Its fabulous for detailed work. I don't think, however, that you can just have one quilling tool. There are just different things that require different tools. It's perfect for scrollwork and intricate designs. But for regular fringing and flowers I think I still prefer the regular tool because you can get the piece off of the tool easier. I did leave out the needle tool. I know that most professional quillers swear by that tool. But, it doesn't like me and I don't feel very fond of it either! I'm super pleased with the results of the tiny quilling tool and I'm sticking to it. It's literally a little more than 3 inches long and has a movable barrel that makes it super easy to use. It is imported from Japan and it is not cheap in the least, especially compared to the regular tools we have here in the States. If you'd like more info I'd be happy to provide it, but I am not sure how/when the tool would be shipped in light of all of the latest happenings in Japan. YOU ROCK!!!!! quill on my sista!!!! woo hoo!!!! Snow? I feel for you:) Its sunshine in Florida. I love your quilled cards! 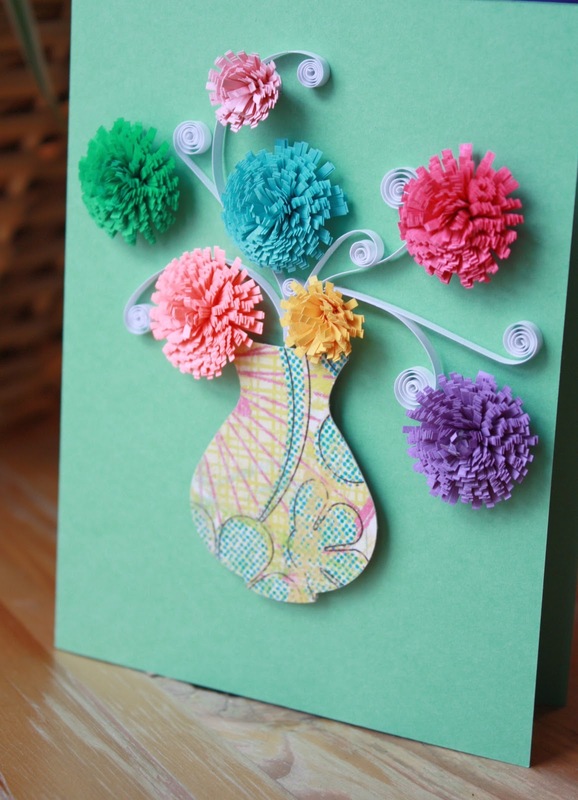 lovely quilled card, I can see the difference in the coils! I loved the card. the vase luks gorgeous and the the swirls really add up! So glad you're enjoying the new tool. 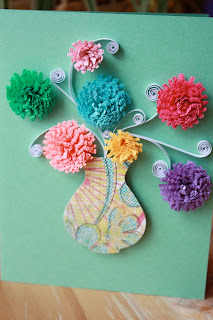 I totally agree... it's handy to have both kinds and find that a regular slotted tool is perfect for fringed flowers. Sturdier, so you don't need to worry about breaking the fine tip of the Japanese tool. Which company made the green one with the ergonomic handle? All tools would benefit from a handle like that! Cute vase of fringed flowers btw! Thanks for all your comments! 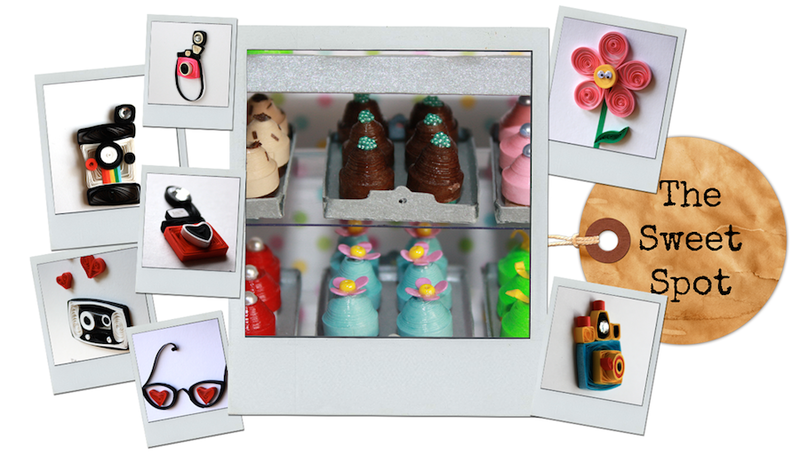 @Ann, I purchased the tool from Custom Quilling. Came in a handy kit with other goodies and extremely reasonably priced. You can find it here: http://www.customquillingbydenise.com/shop/quillingpapercrafttoolkit-p-2221.html?osCsid=f3ff241402fa37c026236cf282c40d43 It's really easy on the hands and the scissor has a tiny pinking effect. It reminds me of the strips used by Malaysian quillers. It is a virtual gift and it is another way to say to whole world we exist and we want to know between us. Because I admire your work so much, I've awarded you on my blog! Come and pay me a visit to see it! Thanks so much for taking the time to leave a sweet comment! It means a lot to me. Even if I don't get around to responding, be sure that I have read and appreciate your input. All content included on this site is created by Leesandra Diaz, a.k.a. Sandy Diaz, unless otherwise noted. Original artwork and images are shared for your personal inspiration and enjoyment ONLY and may not be copied, imitated or sold in ANY form. Please do not use any artwork, designs, quotes, photos or content from this site without prior explicit permission.